Common Ground: Kelvin Smibert was introduced to Sadiki at the Mount Gambier Men’s Shed and has since taken him under his wing. Mr Smibert holds a detailed redgum sculpture Sadiki carved for him as a gift. With one harrowing statement, Sadiki Kamuldele paints a picture of life in war-torn Congo. “I saw people killed every day,” the former refugee said, speaking to The Border Watch about the 21 years he lived near the Congo/Rwanda border during the Second Congo War. While a language barrier prevents Sadiki from providing an in-depth account of the horrors he witnessed, the civil war is counted among the bloodiest in recorded history, with an estimated five million dead. After spending the first two decades of his life surrounded by violence, Sadiki fled to a refugee camp in Zambia in 2003. “I was 21 years old when I escaped to the refugee camp,” he said. “The conditions there were not good, but that’s where I studied wood sculpture and painting. Creative expression became an escape for Sadiki and he soon discovered he had a natural talent for wood carving. During his 13 years within the confines of the camp, Sadiki honed his craft and welcomed his first two children with wife Adele – Brigitte and Jonathan – now nine and five years old respectively. In 2016, the young family was provided an opportunity to start anew life and travelled over 11,000kmfrom Zambia to Melbourne. “We flew from Zambia into Melbourne and directly from Melbourne to Mount Gambier,” Sadiki said. “We have been here for around one year and seven months. 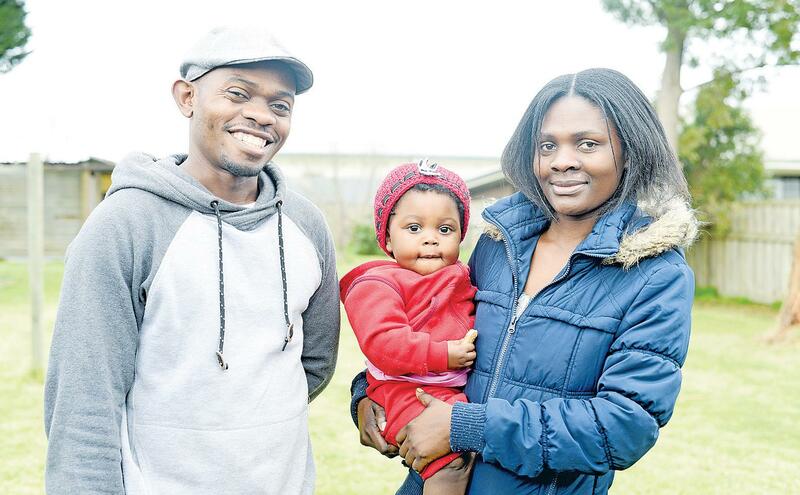 Adele and Sadiki welcomed daughter Estea, now one year old, after their arrival in Mount Gambier and Sadiki now works in Naracoorte six days a week to support his family. Young Family: Sadiki and Adele with their one-year-old daughter Estea. When time allows, Sadiki connects with locals at the Mount Gambier Men’s Shed. It was at the Men’s Shed Sadikimet Kelvin Smibert shortly after his arrival. “Sadiki was introduced to me with a request that he might find a mentor for woodwork,” Kelvin said. “I’ve taken him under my wing with my artist background and the men’s shed has been great in securing for him all the power tool she needs to sculpt. Sadiki often works 11 hour days between the two-hour round-trip from Mount Gambier to Naracoorte. “I work at a meat factory – it’s one hour driving every morning and every night,” he said. “I wake up at around 3am to start work at 5.45am and finish at around 4 or 5pm – it’s a long day. Sadiki speaks French and Swahili fluently, but said he was struggling to grasp English. “Before I arrived I spoke no English at all,” he said. Kelvin said finding meaningful work and a job closer to home had proven challenging for Sadiki. “Speaking only limited English rules you out for most jobs,” Kelvin said. “Sadiki has been looking for work here and I know he’s a diligent worker and I hope a door will open for him eventually. Sadiki finds joy sculpting redgum and limestone in the small workshop he built in his backyard. “He has taught himself to sculpt using limestone since he moved here,” Kelvin said. “His sculptures are almost unbelievably good – to see him start with the raw redgum and carve out such detailed sculptures is extraordinary. Kelvin said an exhibition scheduled for March 2018 would potentially showcase Sadiki’s work alongside the work of artist Ivo Tadic. “Ivo created the limestone wave sculpture you see on the way into Port MacDonnell, among other largescale works across the region,” Mr Kelvin said. Sadiki said he was creating a body of work for the exhibition in his free time. “If I’m not busy I can complete a sculpture in two days, but I’m often very busy with work,” he said. “I still have time before March so I will have many sculptures ready for the exhibition. Kelvin said he believed there was a market for Sadiki’s work and hoped the exposure would allow Sadiki to pursue art as a career. “A little while back when we first approached the gallery about exhibiting some of his work, we took in one sculpture as an example,” Kelvin said. “The gallery staff were very impressed with this sculpture and displayed it in the gift shop.